550 Geary, near Taylor, SF, CA (415) 292-6360 | website | Located in the Hotel Adagio, Union Square, it has an attractive side entrance separate from the Hotel lobby. TK made reservations for an early dinner, which was a good thing as the bar was packed when I arrived! She was slightly delayed, so I ordered a nice cold pilsner (appalled at the $7 price btw) and settled down in an elegant chair to chill with the beautiful people. It is very stylish inside, the exuberantly designed light fixtures and Mondrian inspired back-lit panels on the walls are elegantly space-age. We received complimentary cheese gougieres garnished with shreds of parsley. 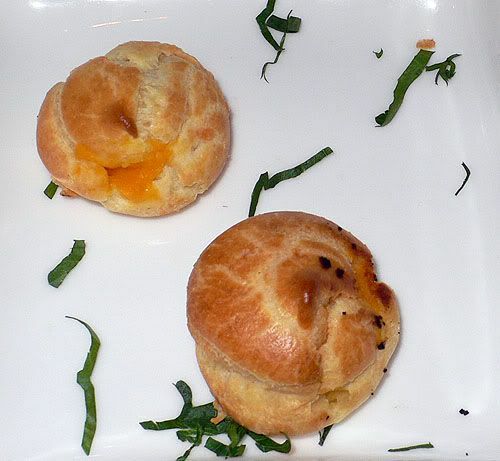 The bite-sized pastries were crisp and eggy rather than flaky and filled with gooey melted cheese. The carrot ginger soup topped with saffron and chive froth was served in a shot glass. It was warm (rather than hot which would be bad in that thin little shot glass) and savory with a rich body devoid of dairy fat. This was my first experience with froth, and the sensation reminded me of the bitter salty fizzy bits floating on top of alka seltzer… The glass was very small, about 2.5 inches high (looks much bigger in this pic). 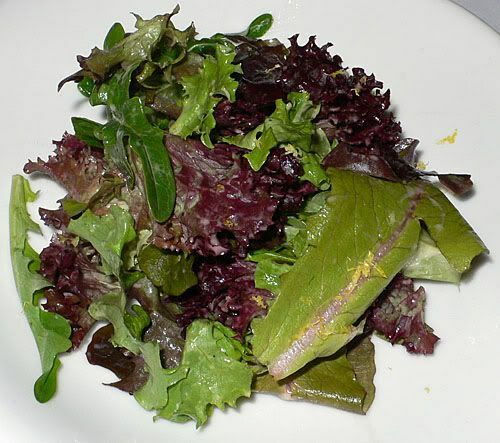 Next came a salad of baby greens with surgically thin shaved radishes, lemon zest and dressed very well with a light vinaigrette. TK had the house made ricotta ravioli with sherry emulsion, melted leeks and wild mushroom ragout. The sauce was luscious and rich and the sumptuous raviolis were filled with creamy and slightly sweet ricotta cheese. I greatly enjoyed poached scottish salmon with meyer lemon, served over orzo with herbed baby artichokes and charred onion vinaigrette. 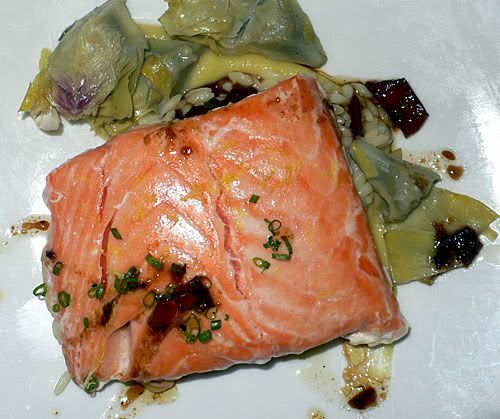 The texture of the salmon was ethereal and melting, scandalously succulent; which was complimented by the firm baby artichokes and bits of charred onion in the sauce. 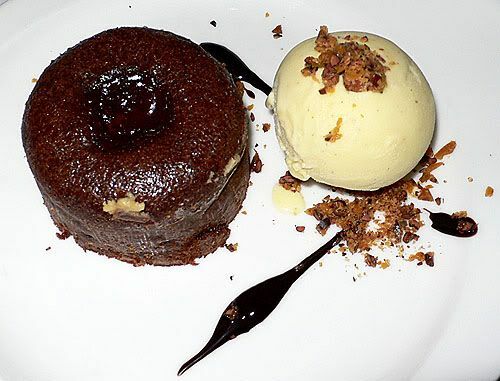 Warm double chocolate truffle cake with Madagascar vanilla bean ice cream and salted cocoa nib crunch. The cake arrived piping hot and the ice cream melted quickly if you spooned it into the molten center of the truffle cake. The cocoa nibs were vividly crunchy and sticky, mmmmm! 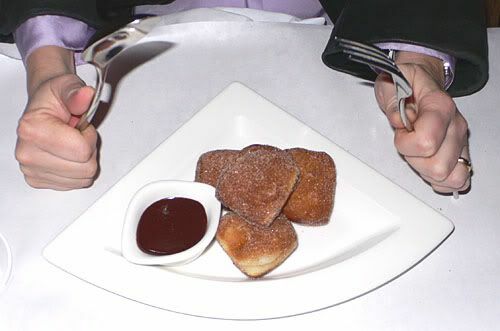 TK had the sugar and spice beignets with Venezuelan Chocolate fondue. These were soft squishy little donut puffs rolled in cinnamony sugar (more spice than sugar) and so good dipped in the dense dark chocolate fondue. 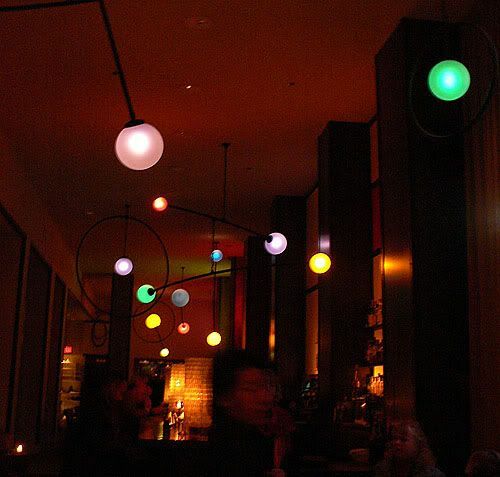 I loved the meal and the stylish ambiance. I’d like to go back for other preparations of pasta here as I was smitten with the raviolis. 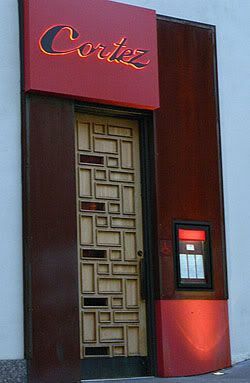 We paid about $60 each, half of which was for the bar, the other half for the 4 course dine about town – but well worth it, in my opinion.